Strap your iPhone or Android smartphone into a Google Cardboard VR headset to experience a surgical suite layout design in virtual reality. Google Cardboard is compatible with Android phones version 8 or higher, and iOS 9 or higher. If you do not own a Google Cardboard, it costs $15 and is available for purchase here. 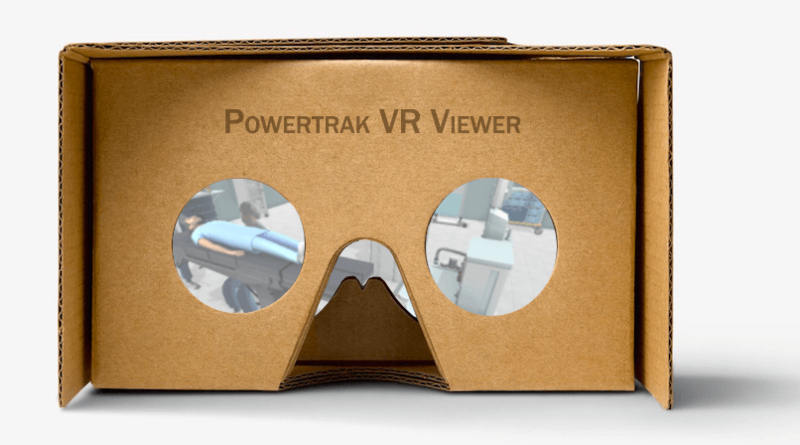 Powertrak VR Design View is available for download on Google Play and the Apple App Store. From your smartphone, click the OR Suite or Kitchen button. It will automatically open the design in the Powertrak VR Design View App. Insert your phone into Google Cardboard and line up the two divider lines. *If you're viewing this page from a non-mobile device, send an email to your phone and click on the link to open this page. **If your smartphone shows a warning notification: "This application may not work properly without Google VR Services..." click the cancel button. Hold down the Google Cardboard button (located on the top-right of the device) for 1-2 seconds and release. You will teleport to that location. Powertrak VR Design Viewer is an affordable and effective way for manufacturers to distribute immersive VR of customized product designs and floor space planning layouts to its customers. This mobile viewing experience helps customers make better and faster buying decisions by visualizing 3D product models and exploring custom designed environments. This is a read-only experience for scene viewing and exploration. For those looking for virtual reality with product interaction, learn more about Powertrak VRoom. *Google Cardboard is a trademark of Google Inc. Google Play and the Google Play logo are trademarks of Google LLC. Apple, the Apple logo, iPhone, and iPod touch are trademarks of Apple Inc., registered in the U.S. and other countries. App Store is a service mark of Apple Inc., registered in the U.S. and other countries.